Alan Bleviss, a voice-over actor based in Canada, is the President of the Civil War Token Society. Alan provided a wealth of information about Civil War tokens in the following interview. 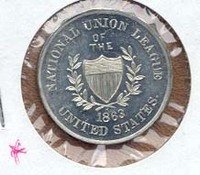 ephemera: How did you become interested in Civil War tokens (link to related eBay auctions)? Bleviss: In late 1994, I bid and won a small collection of coins at the auction. 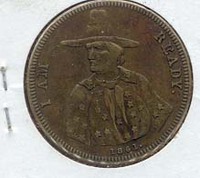 Attempting to do some research, I discovered it was a Civil War Patriotic token. I began frequenting local coin shows and asking if they had Civil War tokens, but typical response was either 'no' or 'I used to have a very fine collection of white metal ones, but sold them long ago.' This peaked my interest. Several years into my collecting of these tokens, I met a dealer who asked if I had anything for sale. Upon explaining that I did not wish to retain my coins, he purchased all the things I had lost interest in. Those funds became my base for acquiring my present collection, which numbers almost 4,000 different varieties. ephemera: These are very interesting items. Tell me more about them. Why were they produced? Bleviss: Civil War tokens are either Patriotics or Store Cards, the former without specific identification as to its city of origin and may contain a patriotic phrase, such as CONSTITUTION FOR EVER or THE UNION MUST AND SHALL BE PRESERVED. Store cards on the other hand are very much a part of advertising as they contain the merchants name, usually an address with the city and state and also the merchants product. Because I am involved in advertising, these appealed to me immediately. Why were these tokens struck in the first place is a great question? During he war all metals were hoarded, because the government used whatever metals available for arms. The shopkeepers needed change in their day-to-day transactions. Die sinkers had salesman traveling by train, offering to strike tokens with the shop keepers info on them at a fairly reasonable price, and thus, two things were accomplished: the merchants had change for everyday transactions and they could advertise their business. The majority of the tokens come from cities and towns that had train stops. There is a lot of factual history on these tokens. The rarities are from the southern states, the confederacy, because the die sinkers were northerners; the distrust of paper money; the impracticality of postage stamps as coinage, etc. One short note of importance, the shop keepers accepted each others tokens. When I began collecting, I thought to collect one of each variety, but that is a task never completed by anyone and is just impossible, when some are simply unique, one of a kind. Now, I attempt to obtain at least one of each merchant, and if a variety is available which I do not have at a reasonable price, I will attempt to obtain it as well. The fact that a token is unique means the price is as well. Some merchants had thousands of tokens struck and some just a few. There exists a merchant from Detroit, Dr. I.C. Rose whose token reads TREATS ALL CHRONIC FEMALE & VENEREAL DISEASES, DETROIT, it had to be advertising! There are five varieties of this merchant and only one is fairly plentiful, between 75 and 200 known to exist,the other four varieties total about twenty all together, but the subject matter still keeps it fairly pricey, depending on condition. Because some merchants have but two or three tokens known to exist, they are difficult to acquire. I have a 'want list' that circulates to the major Civil War token dealers, and I will say that the very rare ones never reach the public’s eyes or ears. I constantly search eBay and attempt to attend the ANA conventions. ephemera: What are some of your favorite tokens? Bleviss: My favorite tokens are those from The Shakespeare Club and that is most likely because of my theatrical background. The rarest of tokens also are favorites of mine, because they are so difficult to obtain. The other ones I also love are the white metal tokens and if reasonable, I attempt to pick them up, even if Patriotics. To achieve success in collecting, my advice is to read the book first, before you buy. Research is most important. It is extremely disturbing to me to see a token valued at about $40-50, sell on eBay for $188 or more and when you look at their feedback of 1 or 2 you realize they are new and not informed or educated as to the value of the token. If you have an interest in Civil War tokens, buy those in the best condition you can afford. I have purchased holed tokens and when a nicer one appears, I upgrade. My other advice is to narrow your interest. Store card tokens, for example, can be collected by profession...grocers, dentists, hardware stores, women merchants, boots and shoes, saloons, hotels, stationers, etc. You could collect by die strike, a specific state, city, or town. Start smaller--you can always expand. ephemera: What resources do you recommend for people interested in collecting Civil War Tokens? Bleviss: The resources I use are three basic bibles available from the Civil War Token Society at a discounted rate if you are a member, which will cover the $10 membership fee, if you get one of them. U.S. Civil War Store Cards (Second Edition) by George and Melvin Fuld. Patriotic Civil War Tokens, 5th Revised Edition by George and Melvin Fuld, 2005 and The Civil War Token Collectors Guide, including Complete Token Valuations Year 2002 by Bryon Kanzinger. I also use Rulau's United States Tokens, but mainly as a reference to prove a claimed civil war store card was actually struck before 1860 or after 1864. I have several reference books on sutlers and the Civil War, but my three bibles are well worn. The Civil War Token Society is the best reference on these tokens. For the annual fee of $10, you receive our quarterly journal which contains articles on these tokens, an auction of tokens in each issue and a free to members page of ads titled The General Store. The books I mentioned above, excluding Rulau’s are for sale at a member’s discounted price which will pay for your membership. We meet annually at the ANA Convention, this year in Milwaukee on Friday, August 10th. You do not have to be a member, so come check it out. 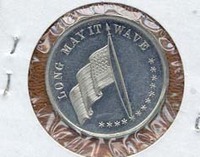 The Society's mandate is to create interest and educate those who might be drawn to Civil War tokens. My tokens are kept in Mylar-coated cardboard 2x2’s and those are kept in loose leaf books so that I can look at them. A lot of loose leaf books, but I enjoy their accessibility. Some have been slabbed, purchased that way as I am not into slabbing. Slabbing has caused the price of tokens to escalate and I began collecting because they were not expensive and they were circulated as change, but then so were coins. To each his own. Before I end, I wanted to point out a couple things: Most of these tokens were copper, but off-metals, such as German silver, were struck for collectors at that time or given to the merchant as a souvenir example of his purchase, and thus, un-circulated and unique. Another interesting point is that there are still tokens no one has seen before, which we hope will be cataloged in the new store card book when it is completed. You still have the opportunity to discover new finds, and that is exciting. The tokens of the Civil War played an important role in the history of federal currency, because when the war ended, a New York postal employee approached the merchant Gustavus Lindenmueller, a New York Saloon keeper, who had thousands of tokens struck, to redeem them in federal currency. Of course, Lindinmueller refused and soon after the Federal Government passed a law prohibiting the manufacture of private currency. The saloon keeper was not wrong, as you will see when you view these tokens, some are wafer thin and others much like a cent, which they were taking the place of. ephemera: These tokens really bring the Civil War era to life. You've provided excellent information, Alan. Thank you for sharing your expert knowledge and thoughtful advice. Just a note to say the dues of the Civil War Token Society were raised this year to $15 a year... still a bargain. My mother has a civil war token, I believe the date is 1865. On the front over the bust is the word "Union" and on the back the words "our card". I have looked but can not find the coin in any listings. Could I be reading the coin wrong or could it be a fake?